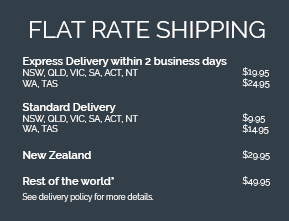 There are several ways to find a product on the Waterford Crystal Australia online store. To browse all our products by category, product collections or designer, use the main navigation. To search for a product, use the Search box in the top right-hand corner - type a keyword e.g. collection (“Lismore”), a designer (“John Rocha”) or a sub category (“Wine glass”). After searching, you are able to refine your search results by e.g. product collections, category and designers. You are also able to sort your search results either alphabetically (ascending or descending) or by price (lowest or highest first). You can only log in to your account if you have previously placed an order and then created an account with us. To create an account with us tick the ‘Create an account’ box at checkout. You will then be able to checkout more quickly, access your wishlist and track your orders. Even if you receive emails from us, you have to have created an account to be able to log in to your account. You can call our Customer Service team and they can guide you on how to place an order online, just give a call to 02 8665 8200 or Toll Free 1300 852 022. Our Customer Service team are glad to assist you from Monday to Friday, from 9am to 5pm and Saturday 10am to 4pm (Sydney time). You can pay for your order by using a MasterCard, VISA or America Express credit card, Paypal and zipPay. 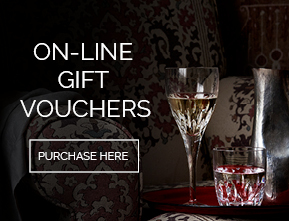 If you have received an Online Gift Voucher, you can also use that for payment. For more information on payment, please refer to our full Terms and Conditions. We comply with Australian data protection and privacy laws and take measures to make sure that all the information you give us, including your credit or debit card details, remains private and secure. We process your payment and registration information confidentially. Can I engrave my crystal/fine crystal product? We offer personalisation on a range of crystal and fine crystal stemware, decanters and vases. Our in-house personalisation team have been trained to engrave our products using specialised technique that provides a superior result and does not damage the product. We do not recommend engraving/etching of our products by any third party suppliers. How do I personalise/engrave a product? All items available or suitable for engraving are indicated as such. The item’s product page will indicate the style of engraving that is offered: monograms, couples pair or personalised 20 character messages. Please allow 7 business days prior to shipping for the personalisation/engraving process. All of our engraved items are non-refundable and the text/message entered cannot be changed once the order is submitted. Can I get all products engraved in a Decanter Set? No, only the decanter will be engraved. Can my personalised/engraved product be expedited? No, personalised items cannot be expedited, we require 7 business days processing time to personalise your order. What are the Personalisation/Engraving Terms and Conditions? Personalised/engraved purchases are customised to your specifications and may not be changed, cancelled, returned, exchanged or refunded. Personalised/engraved purchases may include additional engraving charges, which are non-refundable. Personalised/engraved purchases require an additional 7 business days from the date ordered to account for production time and once it has left the warehouse it will be delivered in 2-10 business days via our standard delivery option, longer for international delivery. You must acknowledge that you previewed your personalisation selection to verify your personalisation type choice, font, and the spelling and accuracy of all text/messages entered. We will personalise/engrave the product exactly according to the choices you selected and data you entered. All 2 to 3 character monograms will be engraved in CAPITAL letters and the 20 character message will be engraved exactly as it is entered. The final size and placement of your personalisation is at the discretion of the Waterford personalisation department. Gift wrapping is available on all products for $5.95 per item wrapped. Each product will be wrapped with white wrapping paper and tied with a branded ribbon. Our gift wrapping service includes a gift card where you can add your own message, the message is limited to a 120 character limit (this cannot be changed/modified once you have submitted your order). To add gift wrap to your order, you can select this option at Checkout. An example of the gift wrap, branded ribbon and gift card is viewable at checkout. The gift wrapping option must be selected at checkout and prior to submitting your order and cannot be added after the order is submitted. Any gift wrapping costs on the original order will not be refunded unless the item is faulty or broken. Does Waterford ever sell substandard items? Sometimes it is possible to repair chipped crystal, though the quality of the repair depends largely on the capabilities of the shop. Contact the Waterford Customer Service Department on 1300 852 022 for contact details.